Gambling is something which has been around for so many centuries and generations. It started perhaps with casino gambling in its primitive form and has evolved and grows with time. Today, there is no denying the fact that it is a multi-billion pound business and covers almost all aspects of our daily life. Whether it is simple gaming, sports, cinema, and art or eve politics, there is gambling involved in almost every aspect of public life. In this article, we will be looking at gambling purely from the perspective of the next Tory leader. Before getting into the odds aspect of the next Tory leader let us see what public perception and opinion is all about. Right now, we have Theresa May as the Prime Minster, and hence it would be right to start from her. She is without any doubt a grassroots leader, and therefore she does stand a good chance of being re-nominated again. However, this would hinge on her performance over the next four years and would depend on how the Labor Party can regroup itself and find a new, powerful and acceptable leader. There are others like Andrea Leadsom who could also give May a run for her money. Further, the Conservative Party has no dearth of leadership, and there are the likes of Boris Johnson, Philip Hammond, Michael Gowe, Sajid Javid and much more. Hence, May certainly will not have a smooth ride, and the task is cut out for her. Let us now look at the odds which are there from the bookies and let us try and use this as a yardstick to identify the next leader. 52 years old Boris Johnson is the Secretary of State for Foreign Affairs and one of the trusted lieutenants of Theresa May. Hence, he certainly commands good respect amongst others of the Conservative Party apart from also having a reasonably big following amongst his core group of Conservative Party supporters. Therefore, he has a healthy odd of 5/1 in his favor. 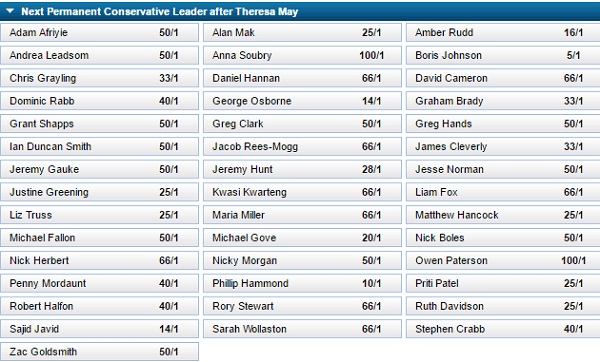 In other words, if you bet £ 5 in favor of a Boris Johnson leader the bookies are ready to pay you £ 1 which means that he has a strong chance of becoming the leader of Conservative Party the next time around. He is another strong and popular leader amongst the Conservatives, and there are quite a few who believe that he has the credentials and wherewithal to take over the reigns as the leader of the Tory Party. However, when compared to Boris Johnson and Theresa May, he is on a weaker wicket if one could put it that way. That is the reason why many reputed bookmakers have offered only an odd of 10/1 in his favor which makes things difficult for him. However, it is not only odds based on which leaders are selected across party lines. A former Managing Director of Deutsche Bank, Sajid Javid right now is the Secretary of State for Communities. Though a high-profile politician, the fact that he does not belong to the local community will perhaps not be in his favor. But he is a good administrator with a lot of modern and dynamic thoughts. It remains to be seen how the party views his candidature should it come up for consideration. 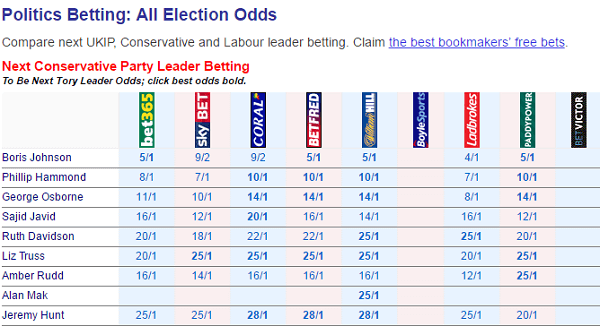 However, the bookmakers and punters are seemingly not so enthused by his candidature. This is borne out by the fact that he enjoys only lukewarm support from the punter and bookies alike. As of now, the odds are not very strongly in his favor with bookies ready to only a 12/1 odd in his favor. This effectively rules out his name as far as the bookies are concerned. But who knows politics could throw some unexpected surprises. A relatively young politician, this charming and gracious 41-year-old lady per many could be a dark horse when it comes to finding out of consensus candidates for the post of the leader of the Conservative Party. She is the Secretary of State for Justice. However, she has been in the Conservative Party since 1996 which is considered a small period. She was previous with the Liberal Party. As far as the odds go, she has an odd of 25/1 which is not impressive, to say the least. At best, she might have an outside chance, but there are reasons to believe that punters and gamblers may not be willing to back her given the fact that she is young and has to content with stronger opponents who are older and have been in the party for many more years when compared to her. She is a Conservative MP of Indian Origin and is one younger member of the current Conservative Government. She is 44 years old and currently is serving as the Secretary of State for International Development. A junior politician of the Conservative Party there are reasons to believe that she may not stand much of a chance against the other powerful leaders of the party. She also does not perhaps enjoy the best of relationships with Theresa May, and this also could be an inhibiting factor. These and other factors perhaps contribute to the fact that she has an almost 33/1 odds against her. Hence when it comes to identifying the next Tory leader odds, almost all bookmakers feel that she does not change even an outside chance. Apart from the above, there are a few other names: David Davis, George Osborne, Jeremy Hunt and quite a few others. Hence, as mentioned earlier, there is no shortage of leaders, and therefore the field is open. Going by odds is just one part of the story, and there are several other factors which also will be considered while deciding the next leader. Therefore, going by odds alone may not be the best way forward. Odds at best can be an indicator and cannot be the only way by which one can decide on political leadership.